Pineapple Coconut Daiquiri in A PINEAPPLE CUP!! Wanna know the easiest way to wow your dinner party guests? Pineapple cups! These are so easy to make. I’m so excited to show you how! And I’ll give you two yummy daiquiri recipes to fill your cups with, but spoiler—anything that’s blended with rum is gonna be wonderful! 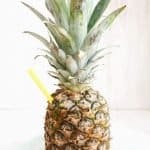 I researched all the different ways to remove the inside of the pineapple and there are methods that don’t need a tool. But this tool works AWESOME, and I found one on Amazon for only $7.99 with prime shipping—so I would highly recommend it (I bought mine locally and it was a lot more than $7.99). It makes it super easy and quick to remove all the pineapple while keeping the skin intact and it even slices it for you. Tip—be sure not to go too deep. On one of my pineapples (I made two, just to practice) I punctured a hole in the bottom on accident. and cut the core out, and you have a perfect pineapple cup! Next I cut my slices into fourths and froze them. When making smoothies or frozen cocktails, I try to freeze some of my ingredients so I don’t have to use any ice and it has more flavor. One last thing…cut a little v out of the top and you have a place for your straw! Pineapple Coconut Daiquiri, serves one. Blend all ingredients and serve in your super cute pineapple cup! Pineapple Strawberry Daiquiri, serves one. 2 scoops ice cream I used Pineapple Coconut Haagen-Dazs—so good! Woah! Looks yummy and quite fancy! Fun recipe. You just wow’ed me on several levels! Oh my goodness…this is BRILLIANT! What a perfect summer drink! THIS MAKES ME SO HAPPY I CAN ONLY TYPE IN CAPSLOCK!!!!! You sold me at pineapple cup! I am so excited to see cocktail recipes again! You guys are my summer cocktail party inspiration ?? This is amazing! What a fun way to serve drinks at a party! I can’t wait to try this! Planning a cook out for this weekend, just so I can try this! Now that’s one cool cup! This would be an amazing party treat. Even the recipe for the pineapple coconut daiquiri sounds phenomenal! This is SO COOL! I definitely have to try this! Had a Pina colada in a Pineapple couple weeks ago at the beach! Looks so tropical and it taste better! Will give it a try for sure! This sounds delicious! Definitely going to save it for reference! This looks awesome and so delicious! I think I need to host a summer party just to try this 😀 And what a great pictures you have taken! I didn’t know that tools to remove pineapple and keep the skin intact is available, awesome! Thanks for sharing! ahhahah it’s so funny!! I’ll buy it too!!! That is so cute! And it looks so easy! This looks amazing! And I could drink those daiquiris all summer long! Perfect drink to serve at a backyard bbq/dance party. Oh my gosh these sound amazing! This is an amazing idea! I love the idea of using the pineapple as the cup and well it’s hard to go wrong with rum! I watched a youtuber used that tool before, but then i couldn’t find it anywhere. Thank you so much for adding that link. You’re my hero. I will definitely try your 2 recipes. You are so thoughtful with the sweet thing. this is such an amazing idea, I always felt like the pineapple skin was so underrated! Like it with coconut milk too! Fantastic! I just bought two pineapple’s, making this today!